About the cultural programm of the XII World Youth and Student Festival. Meeting participants of 12 th International Festival of Youth and Students in the airport. Festival guests at the hotel. Moldavian dance. International Park of the Arts: working chaser, woman spinning. Gypsy dance, a Georgian dance. Museum-Estate Kuskovo: advocates Ensemble Madrigal. Golitsynskii ponds: performance artists of the Bolshoi Theater (ballet "Swan Lake"). Stadium in Luzhniki: are members of the festival. Sings T. Stiving (USA). Acts ensemble from Chile. Clowns, gymnasts, ensemble "Kalinka", the ensemble of Togo. Folk Festival in Kolomenskoye: dancing. PNRM. Pass the festival participants - MS. Girls welcome the festival - CU. PNRM. A young man with a boy - MS. Pass the festival participants - MS.
PNRM. Girls presented the festival guests with bread and salt - MS.
Hand holds a carnation - CU. Guests of the festival - CU. Members of the Soviet delegation - MS.
Dance festival participants - MS., LS., PNRM. PNRM. The building - CU. The youth icon pins girl - MS. The young man looks - CU. Guests at the hotel - MS.
Festival guests at the booth - MS.
PNRM. Bus departs from the hotel - MS. Guests of the festival in the bus - CU. The logo of the festival - CU. On a Moscow street dance amateur groups - LS. Dancing boys and girls - CU., PNRM. Girls and boys applauded - CU. PNRM. At the stadium, waltzing artists - LS. Pass children with flowers - MS. Sings S. Rotaru (synchronous) - MS. Birds in the sky - LS. PNRM. On stage dancing Moldovan dance - MS.
Fashioned figurine - CU., MS. The artist paints the figures - CU. Watch the festival guests - MS.
Chaser at work - MS.
Products from chasing - CU., PNRM. Looking young man - CU. PNRM. Finished Work of coinage - CU. The girl looks - CU. Pictures of the young man - CU. Watch the festival guests - CU. Cruise on the Moscow River - MS.
Museum-estate Kuskovo - LS., CU. PNRM. Performances by "Madrigal" (synchronous) - LS. A scene from the ballet "Swan Lake" (synchronous) - LS. A scene from the ballet "Swan Lake" (synchronous) - LS., MS.
PNRM. Guests of the festival at the stadium - LS. Participants of the festival - CU. City residents welcome the participants of the festival - LS. PNRM. Participants of the festival - CU. The spectators at the stadium - CU. PNRM. Pass the festival participants - MS., LS. Tim sings Stiving (USA) (synchronous) - CU. On stage, the ensemble of Chile (synchronous) - LS. On stage, the ensemble of Chile (synchronous) - MS.
On stage, the ensemble of Chile (synchronous) - CU. PNRM. Pass the festival participants - different. Maria says Shtepanova (Czechoslovakia) (synchronous) - MS.
Festival guests pictures - CU. Guests of the festival - LS. Performers circus performers - LS. Circus performers in a stadium named after Lenin at the Luzhniki Stadium - different., PNRM. Performs trapeze artist - MS. Performers on rollers - MS. Circus performers in a stadium named after Lenin at the Luzhniki Stadium - MS., PNRM. 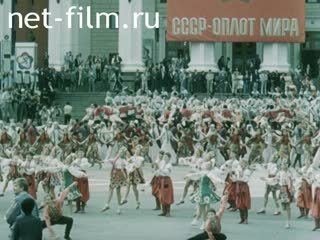 Performances by the "Kalinka" (synchronous) - LS. Performances by the "Kalinka" (synchronous) - LS., MS.
Ensemble of artists and bands from Togo (synchronous) - CU., PNRM. Ensemble of artists and bands from Togo (synchronous) - CU. PNRM. Young people in a disco - LS., MS.
Says B. Kirov (synchronously) - CU. Listen to women - CU. Festival participants - CU., PNRM. Participants of the festival in the showroom - MS. Guest of the festival - CU. Artist Tair Salakhov at work - MS. Portrait of the Cuban cosmonaut - MS.
Artists at work - MS.
Folklore festival in Kolomenskoye - LS. PNRM. Pass the participants of the event - MS.
PNRM. Russian Dance - MS.
A man holds a rooster - MS. Dancing on stage - LS. The young man playing the national instrument - CU. PNRM. Dancing Girls - MS.
PNRM. The young man playing the tambourine - CU. PNRM. Young people dancing - LS. Looking boy and girl - CU. Dagger in a sheath - CU. Strong man with dumbbells - MS.
Festival in Kolomenskoye - LS. PNRM. Dancing youth - MS. The young man - CU. The festival participants exchanged autographs - MS., CU., PNRM.